The sesquicentennial year for both the American Civil War and Mayo Clinic is coming to a close, and before it does, we’d like to use art to show how these two have connections that started over 150 years ago. During the Civil War, President Abraham Lincoln was once referred to as "still in wild water" for his calm and deft handling of the war effort. More than 150 years ago, President Lincoln appointed Dr. William Worrall Mayo as a Union Army exempting surgeon. Dr. Mayo assessed soldiers just like those depicted in the small, ambrotype and tintype photographs on exhibit in the Robert D. and Isabelle T. Davis Gallery at Mayo Clinic in Florida. Dr. Mayo’s role as examining surgeon and his enduring philosophy of humanitarianism, cemented his contributions to the rehabilitation of the nation as a whole by helping his fellow citizens - some of whom could have been soldiers possibly in the same regiments as the soldiers depicted in the photographs on display - to heal, reintegrate and reunify. "Since Mayo Clinic’s beginnings 150 years ago, the Mayo community has valued the restorative effects of the arts and the role of humanities in strengthening patient care. Dr. Will and Dr. Charlie believed that restoring the mind and spirit is an important part of making the body well; and that art and science together play a role in the healing process. Our goal is to create an uplifting and calming environment that inspires hope and comfort our patients, staff and visitors,” explains Chrys Yates, program coordinator for the Mayo Clinic Lyndra P. Daniel Center for Humanities in Medicine in Florida. Complementing the small portraits are large scale contemporary photographs of Civil War battlefields by Eliot Dudik, which helps us recognize the past while looking ahead to the future. Dudik creates his 20” x 50” and 40” x 100” photographs using a century old 8x20 inch view camera, also known as a banquet camera in the early 20th century for its use in photographing large groups of people. He manufactured a custom jig for the camera that allows him to expose two sheets of 8x10 color film whiten the camera at the same time, later bringing the two halves back together digitally. Not only are his images visually representative of the split in the nation 150 years ago and to some extant still visible today, but Dudik’s process reinforces this separation and reunification. 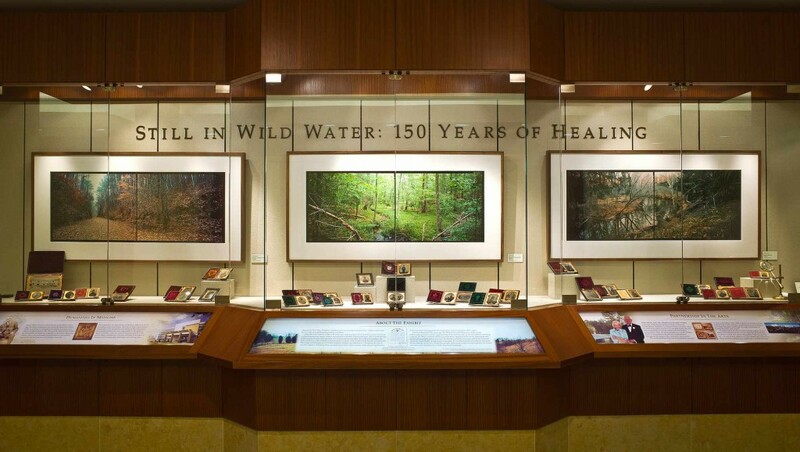 "Something I always consider when deciding on what to exhibit in the Davis Gallery is whether the artwork will engage and enlighten our patients, visitors and staff about an event or program that pertains Mayo Clinic. In this case, the exhibition celebrates Mayo’s Sesquicentennial and the founding of Mayo Clinic,” says Yates. VIEW more photos of this exhibition, by visiting the related Flickr photo album. When asked what would you like for our community to get out of this exhibition, Chrys Yates replies with, "My hope is that patients will connect and engage with the art when they view this very beautiful exhibition, and gain new insight and appreciation for Mayo’s heritage." This exhibition, which honors the Sesquicentennial of Mayo Clinic ~ 150 Years of Serving Humanity, is made possible by the generous support of Richard Look and Henry W. Randle, M.D.